Text Comparison for Excel detects and reports differences in text in files of many formats including office formats: Word, Excel, PDF, RTF, Web Pages, PHP, XML, PPT, files located on FTP and images. Open Office formats are supported as are Unicode documents, RAR and Zip archives. Keywords comparison allows to match non-related documents with different structures. Compare two folders to find and synchronize text changes that were made in each folder. 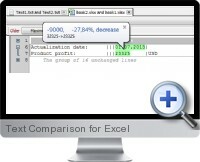 A detailed comparison report can be created once two files or folders have been compared. Document audit allows to accept or decline changes that were made in plain text files. Write comments on changes you or others have made, making collaboration possible. Ignore certain keywords or strings while comparing text. Syntax highlighting popular formats, such as .pas, .php, .htm, .asm, .cpp and others. Comparison of bat, css, dpk, xsl files supported. Multimedia and graphics file property information comparison. Command line allows to automate comparison and integrate Text Comparison with other software. Server-side comparison provides the ability to compare documents online.